Himachal Pradesh Chief Minister Prem Kumar Dhumal has raised the demand to transfer Shanan Power House located at Jogindernagar in Mandi district to Himachal Pradesh as it was long pending issue of the State with Punjab and needed to be resolved in the larger interests of the people of Himachal Pradesh. He said that an agreement was entered between the Government of Punjab and Raja Sahib Mandi on 3rd March, 1925 for setting up of the Shanan Project. The Central Government while issuing the notifications regarding apportionment of assets, rights and liabilities under the provisions of the Punjab Reorganization Act, 1966 had erroneously allocated Jogindernagar (Shanan) Power House to Punjab State on 1st May, 1967. He said that matter of transfer of the said Power Project to State of Himachal Pradesh should be reconsidered. 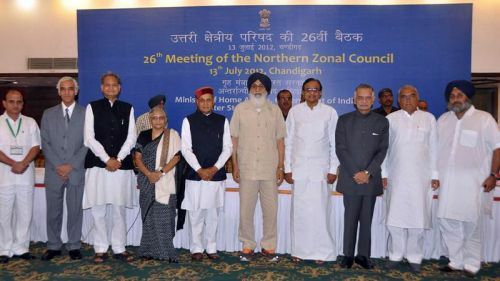 Chief Minister was speaking in the 26th Meeting of Northern Zonal Council at Chandigarh today which was presided over by Union Home Minister P. Chidambaram. Prem Kumar Dhumal stressed for the regular helicopter service in the State to ensure easy accessibility, especially in the snow bound and tribal areas. He said that State Government had been requesting the Government of India for subsidizing helicopter services in the State on the pattern of North-Eastern States as its terrain was almost as of North Eastern States. He said that the snow bound tribal belts comprising of Kinnaur, Lahaul-Spiti districts, Pangi and Bharmour of Chamba district remain cut-off from rest of the world for about 5-6 months every year and comprise of 43 percent of total geographical areas of the State and its boundaries are with China and also Jammu & Kashmir, hence, it needs year round communication besides accessibility to the locals. Union Home Minister assured the Chief Minister to look into it sympathetically. Chief Minister besides raising the import duty on apple to benefit the apple growers, also requested the Central Government to designate apple as a ‘Special Product’. He also requested to approve the proposal of the State Government for installation of 30 sets of hail suppression system. Prof. Prem Kumar Dhumal urged for expediting the work on Nangal-Talwara railway line and treat it as a national project. Chief Minister further requested for giving priority for Manali-Leh railway line keeping in view its strategic national importance and also for promoting tourism in Himachal Pradesh as well as in Laddakh. Referring to demand of Chief Minister for Parwanoo-Shimla four lane road, Union Minister assured that National Highway Authority would be asked to look into it on priority basis and make a comprehensive plan accordingly. The Union Home Minister also agreed in principle not to withdraw ITBP Companies from Border area in Chamba district when the matter was raised by Chief Minister in this regard. Irrigation and Public Health Minister Ravinder Singh Ravi, Chief Secretary S. Roy also attended the meeting.